Joshua Marston is an atypical filmmaker. After graduating from Beverly Hills High School, an interest in photography led him to internships with Life Magazine and ABC News. But, as he says in a 2004 Indiewire interview, he always felt that a photograph didn’t convey the full story; he thought that film might provide the background, context and nuances of a situation far better than even the most evocative still image. But it was only after becoming dissatisfied with working towards a graduate degree in political science that he finally made the decision to become a filmmaker. His thesis film at NYU (about a Russian couple stranded one night in New Jersey who are helped home by two Pakistanis) established a pattern which has held in his subsequent, sparse output: an interest in other cultures and the ways in which social and political circumstances shape individual lives. That film and the two theatrical features which have followed deal with marginalized people far from the attention of mainstream American movies, and all have been shot in other languages with casts taken from the communities being depicted. 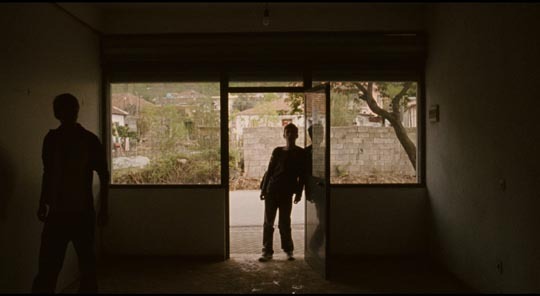 Marston’s first, and best-known, feature was the award-winning Maria Full of Grace (2004), about a Columbian teenager who makes the desperate choice to become a drug mule in an attempt to escape crushing poverty. His second feature, The Forgiveness of Blood (2011), recently released by the Criterion Collection on DVD and Blu-ray, is in many ways a more difficult film to grasp. 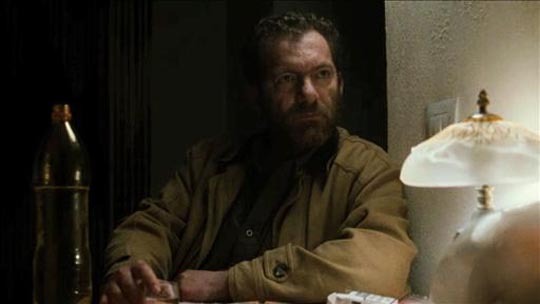 Although the focus on Maria in his previous film might be an unfamiliar angle, the South American drug trade is something which has been highly visible in the media for decades. Life in post-communist Albania, on the other hand, has been virtually invisible to the West. In The Forgiveness of Blood, Nik (Tristan Halilaj) and his younger sister Rudina (Sindi Lacej) are a couple of teenagers who live in a small town. They go to school, they have smart phones, they play computer games. Nik has an ambition to open a small internet cafe in a vacant storefront which he walks past on his way home from school. 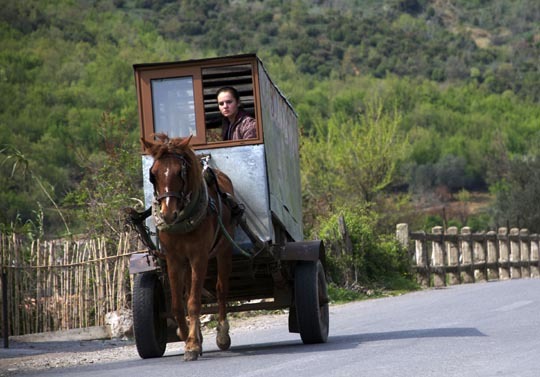 Their father Mark (Refet Abazi) makes a living by delivering bread from a home-made horse-drawn cart, while their mother Drita (Ilire Vinca Celaj) has some kind of factory job. With two younger siblings, Nik and Rudina live what seem like pretty normal teenager lives. However, the small town in northern Albania where they live is not as modern as they are. 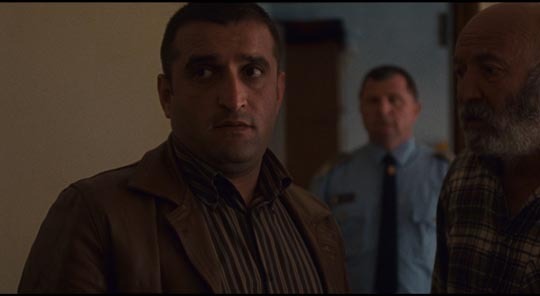 When a dispute with a neighbour over access to a piece of land which used to belong to Mark’s family escalates and the neighbour winds up dead, with Mark going into hiding and the kids’ uncle under arrest, Nik and Rudina find their lives irrevocably changed. For all the external signs of modernity, an ancient code known as the Kanun dictates that blood must be repaid with blood. The family essentially go into a self-imposed house arrest because the other family has the “right” to kill one of the males – either Mark, Nik, or the younger brother Dren (Elsajed Tallalli) – in order to restore honour. In this society, the actions of the fathers are visited on the children with a vengeance. Nik is condemned to stay inside the house indefinitely, perhaps for years. Rudina can no longer go to school as she must take over the bread delivery to support the family. While Rudina, devastated by the loss of her education, must learn to adapt and become strong – her bread business is undermined by a man who buys cheap in the next town and delivers to her customers from the trunk of his Mercedes; she starts selling contraband cigarettes from the cart – Nik is trapped, essentially imprisoned for his father’s crime. This is a story of kids being forced to grow up in ways they never anticipated. Driven almost mad by confinement, Nik’s attitude to his father gradually changes from one of deference to questioning and finally confrontation. Mark occasionally emerges from hiding to bring money and gifts to the family, but Nik comes to see himself as a sacrifice to his father’s destructive sense of honour. 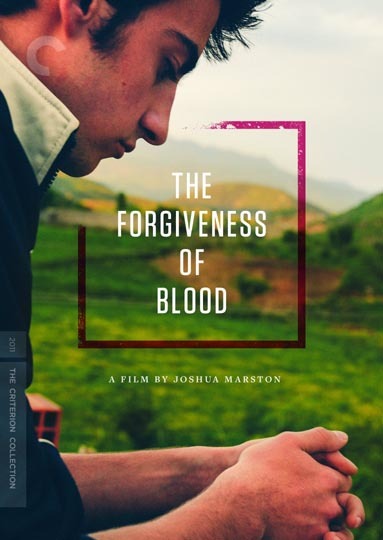 Joshua Marston’s The Forgiveness of Blood is a strange and disorienting film. On first viewing, there seems to be something inherently absurd about the narrative; the home-made horse cart and the smart phones; the power of the blood feud which seems to render the police helpless to deal with the killing, whether murder or self-defence. There is an elegant precision to the images, beautifully shot landscapes and interiors, the richly expressive faces of a largely non-professional cast, but the world we are shown seems to make little sense. Marston simply immerses us in this world without explanation. We see events exclusively through the eyes of the two teenagers, and perhaps this is why the film is confusing; the ancient code which abruptly disrupts their lives is as alien to them as it is to us. It was only after viewing the Criterion edition’s supplements and listening to Marston’s commentary track that things began to make sense to me. These blood feuds apparently affect many lives in the country, resulting in people remaining confined to their homes for years, even decades, with some children born into such confinement and never knowing anything different until they emerge as adults. During the forty-five years of communist rule, all of this was suppressed (according to Marston, there was only one such event during that time), but since the end of communism, with a weak state, the ancient code has reasserted its hold, with families no longer relying on the police and courts to deal with conflicts. But at the same time, the end of communism caused a surge out of backwardness with the influx of foreign technology and wealth. Cars, once rare, became common, existing side by side with horse-drawn carts like the one in the film. And kids born in the past two decades have grown up with computers, smart phones, video games and Facebook. 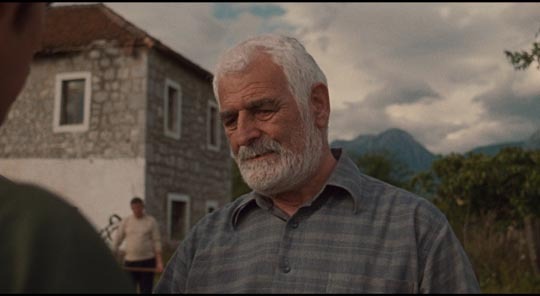 What seems at times inexplicable in the film actually depicts the reality of life in Albania today. Armed with this information, a second viewing of The Forgiveness of Blood takes on a richness and depth not fully apparent on a first viewing. The tension between the sense of freedom and autonomy felt by the kids and the weight of an ancient social code which binds them only really comes into focus when the context is made clear. Is this a failing? Marston set out to make a drama not a documentary, and yet the unfamiliarity of the setting almost demands some kind of background information for the viewer. In the making-of (with producer Paul Mezey giving a useful account of the film’s genesis) and Marston’s commentary track, it’s made clear that the filmmaker immersed himself in the place and the culture, researching these blood feuds in great depth and creating the script by incorporating numerous details learned from actual people whose lives have been affected by them. But perhaps, so steeped in the material and determined to tell the story from within, rather than as an outside observer, he forgot how much he himself had to learn before any of this made sense to him and he just trusts that the viewer will be able to intuit what he had made so much effort to learn. On the level of craft, The Forgiveness of Blood is a skillful piece of work. Rob Hardy’s cinematography is richly coloured and expressive; the performances, particularly of Halilaj and Lacej, but including even the smallest roles, have a sense of depth and authenticity which give the film an air of truthfulness even when the events seem peculiarly alien. Watching it a second time, armed with background information, it becomes a fascinating study of an entire society which is struggling with a confused sense of identity, caught between the weight of a crushing past and the unsettling uncertainties of a present and future which are being overwhelmed by an outside world whose technology and attitudes seem to have no roots in the local history. Marston’s approach to the story is very rare, in that he submerges himself to the point of invisibility, allowing the Albanian cast and setting to exist without external editorial comment. If it reminded me of anything, it was Lionel Rogosin’s searing depiction of South African apartheid in Come Back, Africa (1959), which was also made by a socially committed American filmmaker who cast and scripted the film with local people who were deeply involved in the situations being depicted. 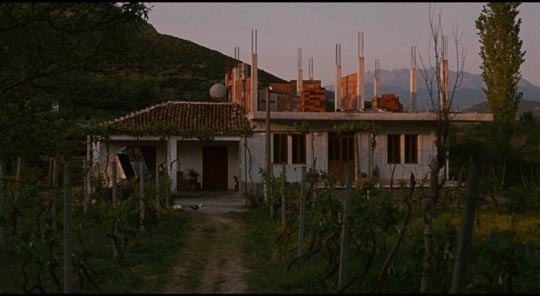 Criterion’s DVD offers an crisp transfer of the subtle, expressive film image with a 5.1 surround mix of the original Albanian soundtrack and optional English subtitles. This is one case where the supplements are extremely useful in understanding the film. In addition to the interview-based making-of and director’s commentary, there’s a discussion between Marston and three of his actors, Halilaj, Lacej and Abazi, in which they talk about both the casting and rehearsal process and the social background of the story. There are also audition tapes and some rehearsal footage which illustrate Marston’s improvisatory approach to script development. In addition, the insert booklet contains more useful background in a brief essay by Oscar Moralde. This entry was posted in Review and tagged Actors, Criterion, Directors, Docu-drama, Review. Bookmark the permalink.